Ho da poco finito di completare un disegno che mi ha fatto sognare un pò. Quante barbie ballerine che ho avuto e quanto le ho amate!... Adoro il tutù! Ad inventarlo fu Eugéne Lami. Il tutù nasce con la nascita di un'arte: il balletto. Le donne all’inizio erano vincolate da bustini con stecche, corpetti, gonne lunghe e sopragonne sorrette da pesanti paniers. Fu Marie Camargo, una ballerina francese, a semplificare l'abbigliamento. Eliminando dalle scarpe il tacco, accorciando gonne e abbandonando le maschere. Alla fine del diciannovesimo secolo, il balletto si evolve ulteriormente e, di fatto, il tutù diventa una semplificazione estrema del normale abito di inizio '800, di cui mantiene in parte il modello: corpetto aderente con vita alla linea naturale o con vita a "V", ampio scollo con spalle scoperte, seno in evidenza, ampia gonna arricciata. Good evening and Happy New Year to all.I just finished a complete design that made me dream a little.It depicts a classical dancer. Even as a child I loved this dance, I do not know why .. but .. enchants me! is poetry! ...How many Barbie dancers that I had and how much I loved them! ... I love the tutu!Invented it was Eugène Lami. The tutu was born with the birth of an art: the ballet. The women initially were bound by corsets and splints, corsets, long skirts and sopragonne supported by heavy paniers. It was Marie Camargo, a French dancer, to simplify the clothing. Eliminating from the heel shoes, shortening skirts and abandoning masks. In the late nineteenth century, the ballet evolves further and, in fact, the tutu becomes an extreme simplification of the normal habit of beginning '800, which keeps the model: fitted bodice with natural waist line or with life " V ", scoop neck with bare shoulders, breasts out, wide gathered skirt. Questo è Il mio tutù romantico disegnato oggi .. 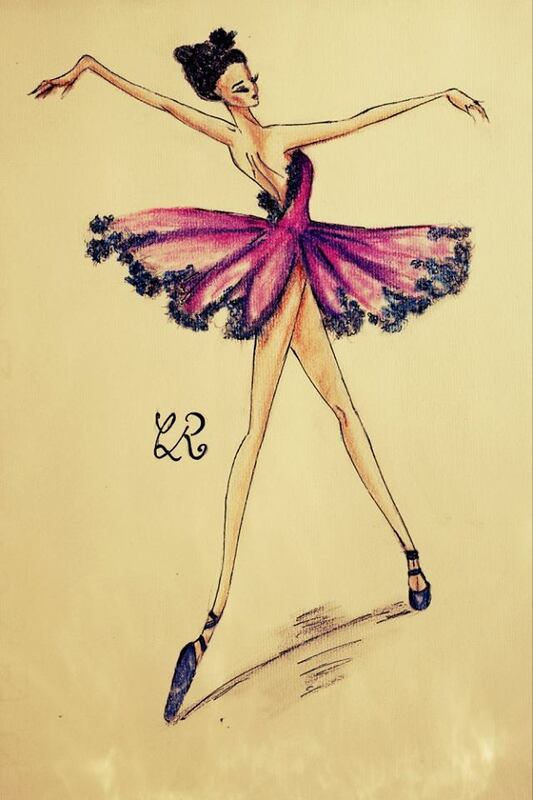 This is My romantic tutu designed today ..